Over the past three years, American writer Ben Ehrenreich has been traveling to and living in the West Bank, staying with Palestinian families in its largest cities and its smallest villages. Along the way he has written major stories for American outlets, including a remarkable New York Times Magazine cover story. Now comes the powerful new work that has always been his ultimate goal, The Way to the Spring. We are familiar with brave journalists who travel to bleak or war-torn places on a mission to listen and understand, to gather the stories of people suffering from extremes of oppression and want: Katherine Boo, Ryszard Kapuściński, Ted Conover, and Philip Gourevitch among them. Palestine is, by any measure, whatever one's politics, one such place. Ruled by the Israeli military, set upon and harassed constantly by Israeli settlers who admit unapologetically to wanting to drive them from the land, forced to negotiate an ever more elaborate and more suffocating series of fences, checkpoints, and barriers that have sundered home from field, home from home, this is a population whose living conditions are unique, and indeed hard to imagine. 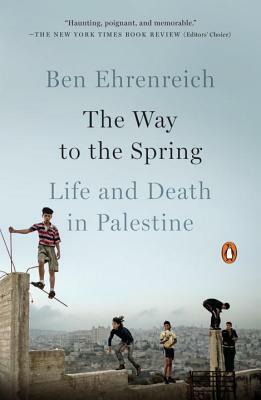 In a great act of bravery, empathy and understanding, Ben Ehrenreich, by placing us in the footsteps of ordinary Palestinians and telling their story with surpassing literary power and grace, makes it impossible for us to turn away. Ben Ehrenreich is the author of two novels, Ether and The Suitors. His writing has appeared in Harper's, The New York Times Magazine, and the London Review of Books, among other publications. A recipient of the National Magazine Award, Ehrenreich lives in Los Angeles.